Leading money earning jockey of 2018, Raul Ramiez, Jr., made it a goal to work hard to get into a position to pick up mounts for the big races in Ruidoso. DALLAS, TX—SEPTEMBER 13, 2018—After having an amazing summer at the recently concluded 2018 Ruidoso race meet, jockey Raul "Chico" Ramirez, Jr. is hoping to harness the momentum of winning both the Ruidoso Futurity(G1) and the All American Futurity(G1) to catapult his riding career to even greater heights. Around the racing world, Thoroughbred or Quarter Horse, there are certain riders who seem to rise to the occasion (and those that seem to flounder) in races of great magnitude. There is not a statistic or a true measurement of this moniker of being known as a 'money rider', as much as it is just an earned reputation. Even prior to winning the huge futurities of the summer meet in Ruidoso, including the $3-Million All American Futurity (G1), the name Raul Ramirez, Jr. in Quarter Horse racing has carried with it the reputation as a 'money rider'. It has been his knack to get up and win those big races, whether in Texas or Louisiana and now Ruidoso, that has him held in the regard of being known as such a rider. Trainer Miguel Rodriguez, who has trained two-LQHBA Million Futurity(RG1) winners with his friend Raul Ramirez, Jr. aboard, points to an ability exhibited by Ramirez of why he has been successful in some of the biggest Quarter Horse races in the industry. 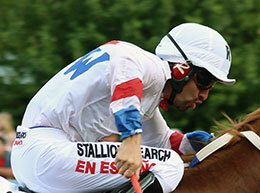 "Raul has an ability to not get nervous in crucial times with he's in the saddle," said trainer Miguel Rodriguez. "I have seen with my own eyes several jockeys let the pressure of the situation get the best of them, and force errors that they usually don't tend to make. Raul has this focus and determination that is rare that allows him to not get nervous in pressure situations of racing." Prior to moving his tack to the summers of Ruidoso Downs in New Mexico, Ramirez applied his trade as a horseman to the racing circuit of Louisiana and Texas. Even though his achievement of winning the most prestigious Quarter Horse race in the world this past Labor Day is his career highlight to date, Ramirez had already guided home the winner of three LQHBA Million(RG1) Futurities prior to making the switch away from riding full-time in Louisiana. "I made it a goal to come to the mountain to work hard to get into a position to pick up mounts for the big futurities," said Ramirez. "Success in California or Louisiana or Oklahoma is great, but it doesn't come close to the notoriety or recognition you get for doing well in Ruidoso. This summer of winning the two big races in nothing short of a dream come true for me." Growing up in Laredo, Texas in a family full of jockeys, Ramirez was destined to follow the family footsteps of race riding. His father, Raul Ramirez, Sr. saw some success as a jockey in the eras of the 1980's to 1990's while guiding such runners as Grade 3 winners Sovereign Bow and Cash Copper to victory. In 2012, Raul Ramirez, Sr. was involved in an automobile accident that claimed his life at the age of 61. "My father was a big part of me learning to be a jockey," said Ramirez, Jr. "I was also provided an environment of family where we would spend all day as children on horseback. My cousins Saul and J.R., and I have been race riding as children; breaking ponies from the starting gates when we were little kids. It was the foundation, and each of us driving each other to be better that has made all three of us the jockeys that we are today." Saul, who is older than Raul Jr., went off to California to make headlines of his own in G1 futurity victories at Los Alamitos. His cousin J.R. Ramirez, also saw success in California in futurities, before coming back to ride predominantly in Texas and Louisiana. 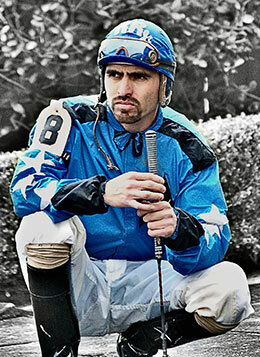 Raul Ramirez, Jr. began his riding career in 1998 at Manor Downs in Manor, Texas. His first futurity win of his career came in April of 2000 when Ramirez guided the John Boegner trained Dust Em Dusty to a win in the Longhorn Futurity(G2). Since that initial futurity win, Ramirez has gone on to post wins in sixteen Grade 1 races and seventy-three other stakes victories. According to AQHA records, Ramirez has 1,516 wins and career earnings of $23,011,212. In 2017, Ramirez had turned 35 years of age and reflected on a career steeped in major stakes victories in California, Texas, and Louisiana, but lacking success at the pinnacle stakes events in Ruidoso, NM. "It was always a dream of mine even as a young child learning to race ride to come to Ruidoso to win the big races," said Ramirez. "I was 35-years old at the time that I decided to try my hand at riding throughout the Ruidoso meet on a full-time basis. My goal was to come up here and work as hard as I could to open up opportunity to ride in the futurities here in the summer." Opportunity can in the form of trainer Blane and Trey Wood. With a large stable at Ruidoso year-after-year, the Wood's stable characteristically uses the services of multiple riders to handle the multiple qualifiers into the summer futurities. In the 2017 Ruidoso Derby(G1) trials, the first-call rider of the Wood racing operation, Ricky Ramirez, qualified five horses into the finals. Ricky Ramirez made the decision to retain the mount aboard Texas Classic Futurity(G1) winning High Plains Perry in the finals. This left Tough To Bee available for Raul Ramirez, Jr. to pick up the mount and eventually found him the winners circle of the $800,000 Ruidoso Derby(G1) as his first big score at Ruidoso. A year later, jockey Ricky Ramirez qualifies both Blue Corazon for trainer Rodolfo "Rudy" Valles and Jest Famous for Blane Wood into the finals of the $1-million Ruidoso Futurity(G1). 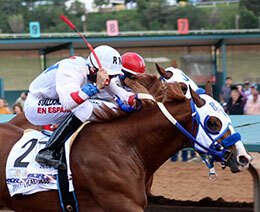 Jockey Ricky Ramirez opted to stay on Jest Famous, allowing Raul Ramirez to pick up the mount aboard Blue Corazon. 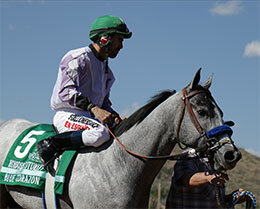 Blue Corazon, a colt by leading first-crop sire Coronado Cartel, scampered out to an early lead and held off all rivals to win the 2018 edition of the Ruidoso Futurity(G1). Three months later, Ramirez finds himself in a very similar situation. Jockey Ricky Ramirez qualified three Wood trainees into the 2018 All American Futurity (G1), and made the decision to retain the mount aboard 2018 Rainbow Futurity (G1) winner MM Fourinthemorning. Raul Ramirez, Jr. picked up the mount aboard Apocalyptical Jess, who was the fastest qualifier from day 1 of the trials. "When I was warming up for the All American aboard Apocalyptical Jess I had my father in my thoughts," said Ramirez. "I said my prayers, and focused on getting down the racetrack. Winning the race was an amazing dream come true. I know my father would have been proud of me to have reached new heights in my career." Apocalyptical Jess became the 2018 All American Futurity (G1) winner with Raul Ramirez, Jr. aboard, also making trainers G. Blane Wood and Leo Wood the first father-son duo to ever win the Labor Day classic event. According to Ramirez, one of the keys to his success is the love and support that he gets from his family. Being in the horse racing world usually means you live a nomadic life from race meet to race meet, and Ramirez points towards his wife Jessica as being the anchor of his success in racing. "Winning these races and the recognition I have received could not have happened without the support of my wife," said Ramirez. "My wife is in the background keeping me grounded, and without her and my daughter (Renata) and son (Raul III) it just wouldn't have been possible." After the highly-successful summer at Ruidoso that yielded two-major futurity victories, Ramirez has a plan to work even harder to find himself in opportune situations. "I had the success in Ruidoso this summer because of working-hard and being at the right place at the right time," said Ramirez. "Hard work has allowed me to live my dream of winning the All American. I have heard the once you win the big race that it makes you just that more hungry to win it again and again. That has certainly been the case for me, as I cannot wait to get back to the mountain to try in again next year". With the achievements of the two-futurities at Ruidoso this summer, Ramirez is currently the leading jockey in the nation with earnings of $2,545,263. 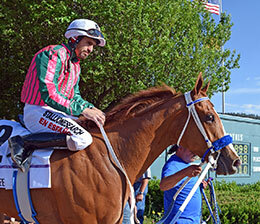 It is his desire to reach for new levels in his career following his win in the All American Futurity (G1). "I want to stay humble and keep moving forward in the next year of racing," said Ramirez. "I want to set an example for my son, Raul III, for me to be one of the top jockeys in the country as he is growing up. I would also like to focus on winning the AQHA World Champion Jockey award in my future. My philosophy is the God gives you the talent, but you have to work hard to get what you want in life."